Blurb: One of the most hauntingly beautiful tales I've ever had the honor to read. Review: Now, I'm going to preface this by saying that this book doesn't come out in the US until 2012 (I believe). But you can buy it now from The Book Depository (free shipping! ), which is what I did, so I'm still going to review it now. If you've read my reviews of Zoe's The Swan Kingdom and Daughter of the Flames you know that, in my eyes, Zoe can do no wrong. This book was no exception. I think it may be my least favorite of her books, but that's not saying a lot. I love her books so much that my least favorite of hers is still more loved that most books. Suzume/Rin/Yue was one of the most complex characters I've ever had the pleasure to get to know (if that isn't obvious by the fact that she has a MILLION names). In this book you watch her turn from an innocent girl into a very troubled woman. The transformation is flawless and totally believable, if completely heartbreaking. 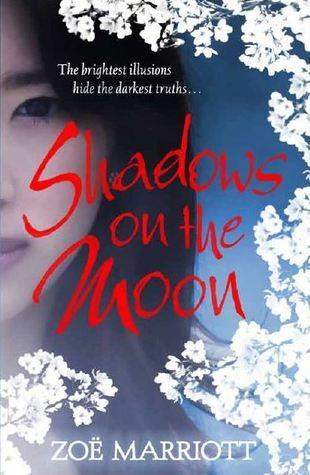 Shadows on the Moon has definitely got a different tone than Zoe's other books. This book is MUCH darker. It reminded me of the original Grimm tales, which are also pretty dark. There were some pretty serious things going on in this book, including cutting. The strange thing was that it wasn't abrasive like that stuff usually is. Maybe it's because the setting was feudal-Japan-esque, or maybe it's just because Zoe's a master. Regardless, I was able to read the book and have all the characters/themes touch my heart, rather than push me away like that kind of thing usually does. That doesn't mean I wasn't affected. There was one aspect of the book (I don't want to give it away) that broke my heart every time the topic was brought up. And I wish I could tell you that everything was resolved in the end, but it wasn't. Instead the book ended with hope. Buckets full of hope. It was a masterful ending. It was a masterful book. Period. Would you remind us of this one again when it comes out in the US? Q, you'd be welcome to borrow my copy if you'd like to read it.